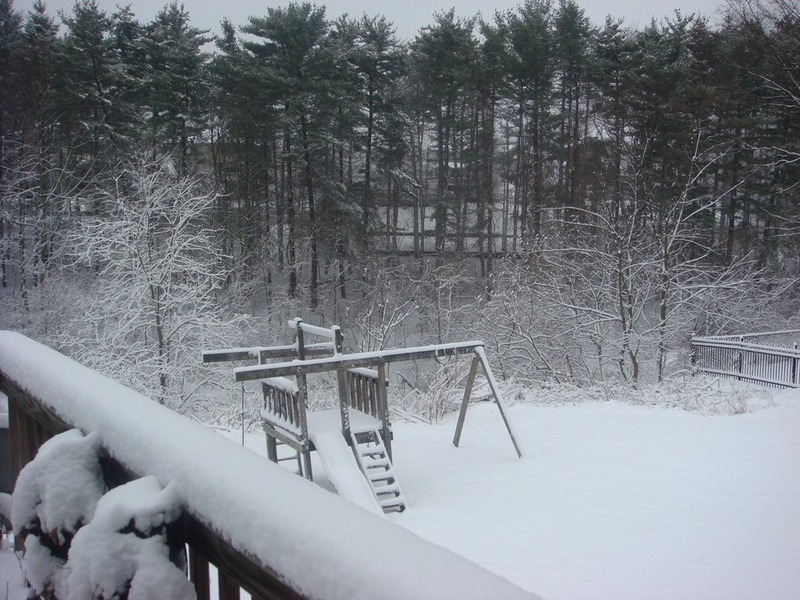 So we are spending our Easter break skiing instead of mulching and gardening, which is certainly making the kids happy! 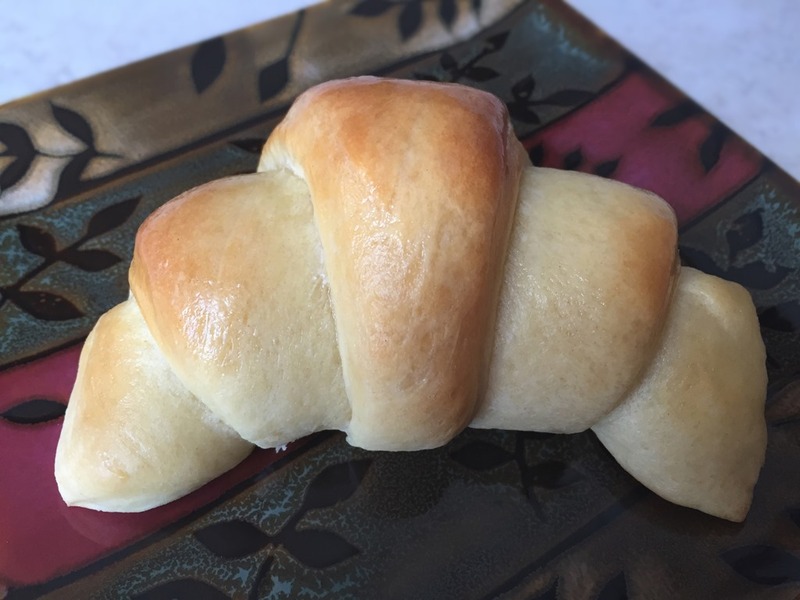 When not on the slopes, we have been enjoying some of our favorite Easter food traditions, including dying eggs (and eating egg salad) and making these sweet rolls which remind us of the symbols of the resurrection. These hollow rolls, symbolic of the empty tomb on Easter morning, are a good way to teach young kids about the resurrection. 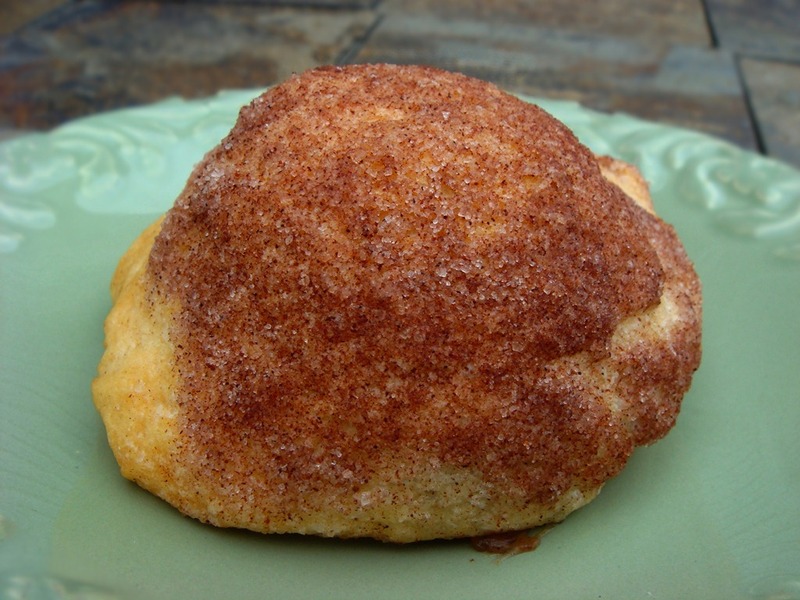 Made from packaged crescent rolls, marshmallows and cinnamon sugar, they are also easy for kids to make themselves. Dip a large marshmallow in melted butter, then roll in cinnamon & sugar mixture. 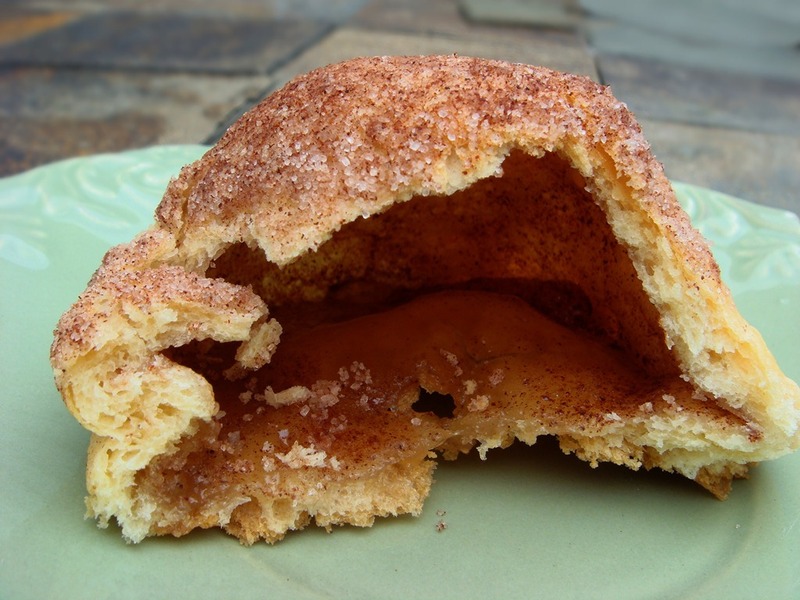 Place dipped marshmallow in the center of a crescent roll. Pinch the dough around the marshmallow, completely covering marshmallow. Pinch seams to seal well. Be sure to seal the seams completely, or the marshmallow will melt all over the baking sheet. Place on prepared baking sheet. Brush tops of rolls with some of the leftover butter and sprinkle with additional cinnamon/sugar mixture. Bake at 375°F for 12-14 minutes. I admit that it feels just a little bit sacrilegious to have the kids talk about dipping Jesus in butter, but it is certainly an object lesson that they remember all year. And a delicious way to remember the reason we celebrate Easter- the gift that was the atonement and resurrection of the Savior, as evidenced by the empty tomb. Line a baking sheet with a silicone liner, parchment paper, or non-stick foil. Combine sugar and cinnamon in a small bowl and set aside. 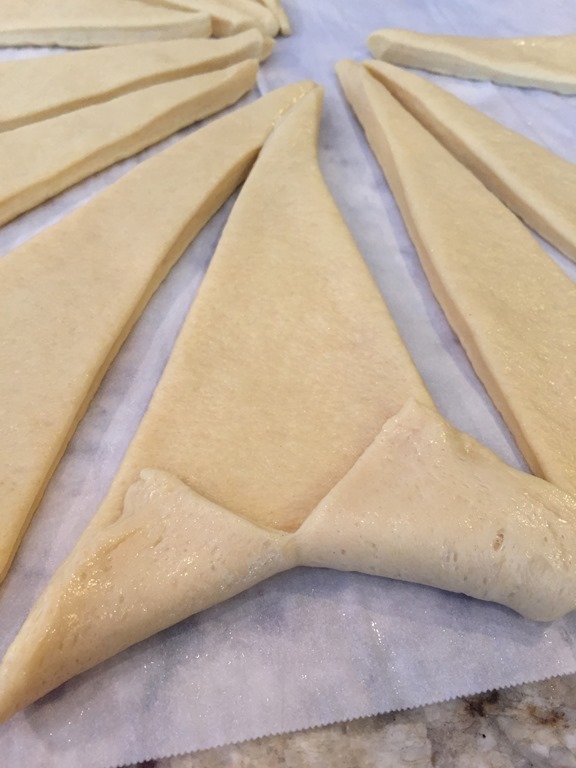 Unroll and separate crescent rolls. 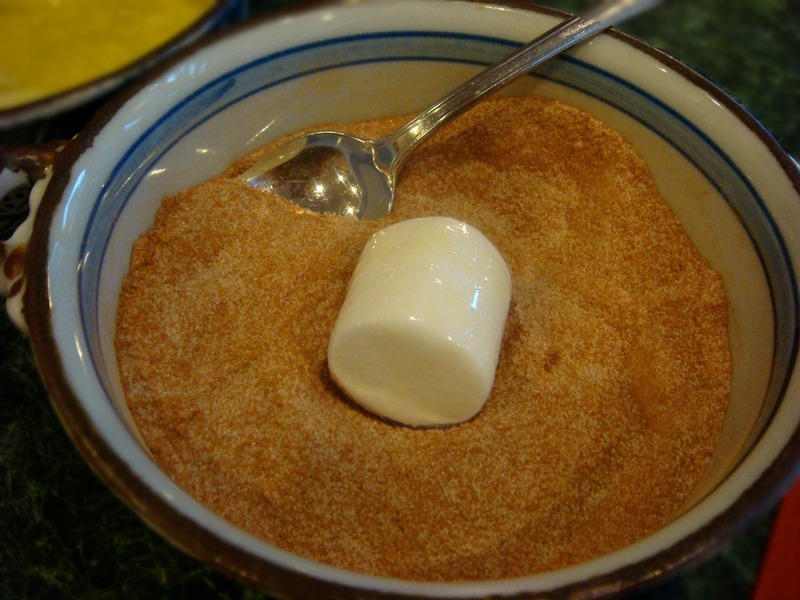 Dip a marshmallow in the melted butter, then roll in cinnamon/sugar mixture. Place the covered marshmallow on a raw crescent roll. Pinch the dough around the marshmallow, completely covering marshmallow. Pinch seams to seal well. Be sure to seal the seams completely, or the marshmallow will melt all over the baking sheet. Place on prepared baking sheet. Brush tops of rolls with some of the leftover butter and sprinkle with additional cinnamon/sugar mixture. Bake at 375°F for 12-14 minutes. Let cool for 2-3 minutes before removing rolls from baking sheet. Serve warm. NOTE: Some of the melted marshmallow may leak during baking, but the roll should still form a hollow tomb. Pinch seams tightly to reduce oozing. 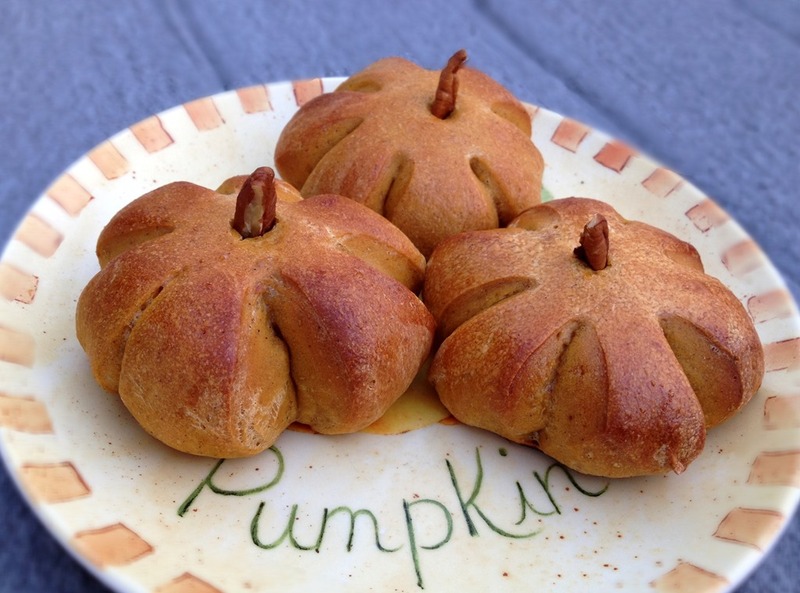 These pumpkin rolls have had a place at our Thanksgiving table for more than a dozen years now. 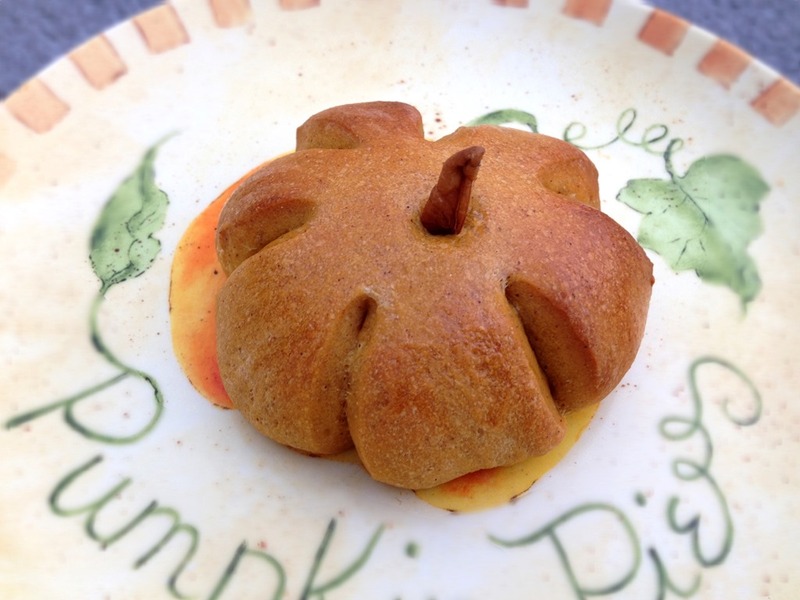 They are a savory roll, not sweet. 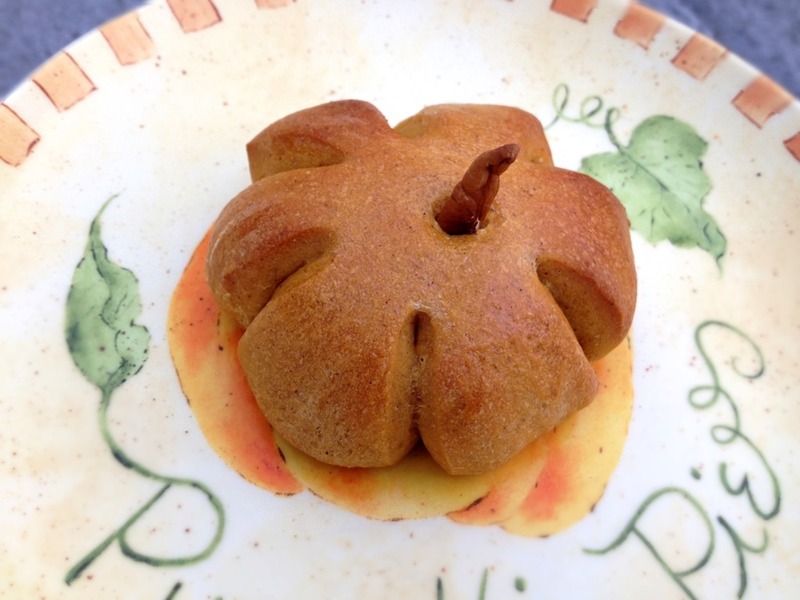 The pumpkin flavor is not strong, but the pumpkin and spices add a subtle flavor that goes perfectly with a Thanksgiving meal. When we are not eating them with Thanksgiving dinner, I like to serve them with honey butter (1 stick butter mixed with 1-2 Tbs honey). 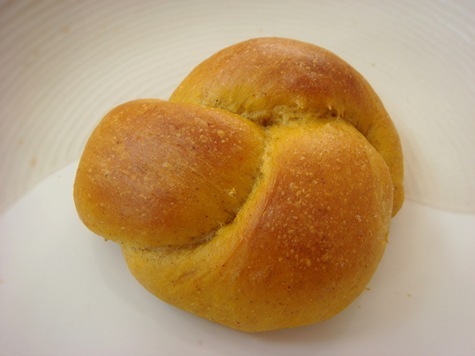 I usually make crescent shaped rolls and knots when I make dinner rolls. 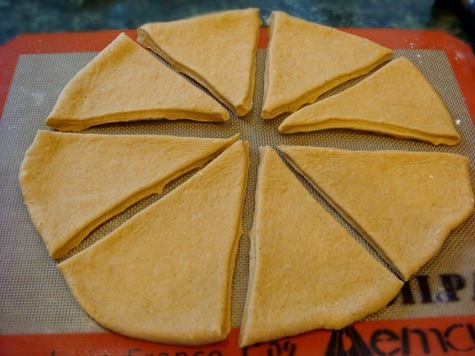 To make crescent rolls, divide the dough into thirds. Roll each third into a circle. Cut into 8 wedges. Roll up beginning with the large end. Pinch end into bottom dough of the roll so that it doesn’t unravel when rising. Place rolls on a greased baking sheet (or use a silicon baking sheet), curving ends toward the center as you place them on the baking sheet. 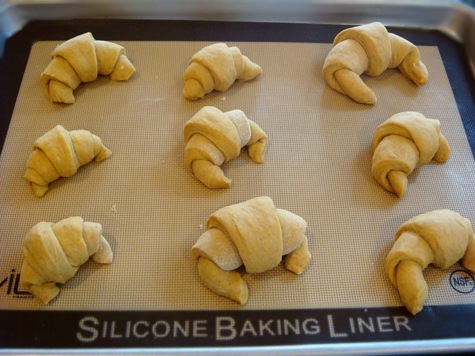 Brush or spray dough crescents with oil, cover with a towel and let rise until doubled. For a shiny finish, brush rolls with an egg white wash (room temperature egg white mixed with 1 Tbs water) before baking. 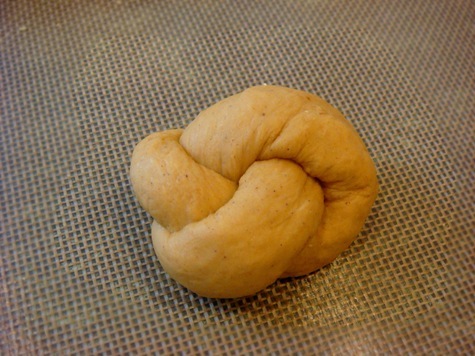 To make knots: pinch off a golf-ball sized piece of dough. Roll it in your hands to make a long rope (about 8-10 inches long). Tie rope in a knot (just like you are tying your shoes) leaving the two ends about 1-2 inches long. Fold two ends around to the back of the knot and pinch them together to seal. Place the knot on a baking sheet with the pinched ends on the bottom. When making rolls for Thanksgiving, I like to make them ahead of time and then reheat them just before serving. I parbake the rolls and then freeze them until I am ready to serve them. Parbaking (or slightly underbaking) keeps them from overbrowning when you reheat the rolls in the oven just before serving. 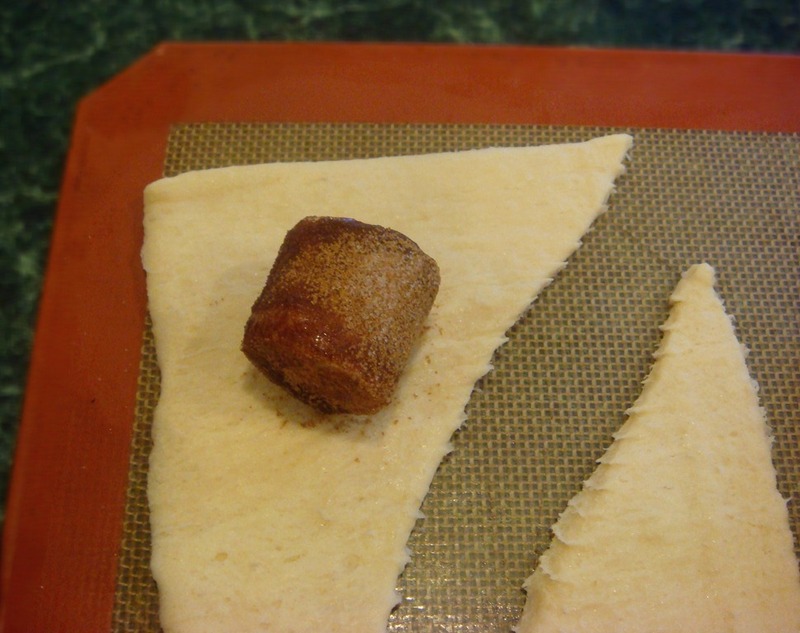 To make and freeze: Shape rolls and place on a large baking sheet lined with parchment paper or a silicon mat. Let rise as usual. 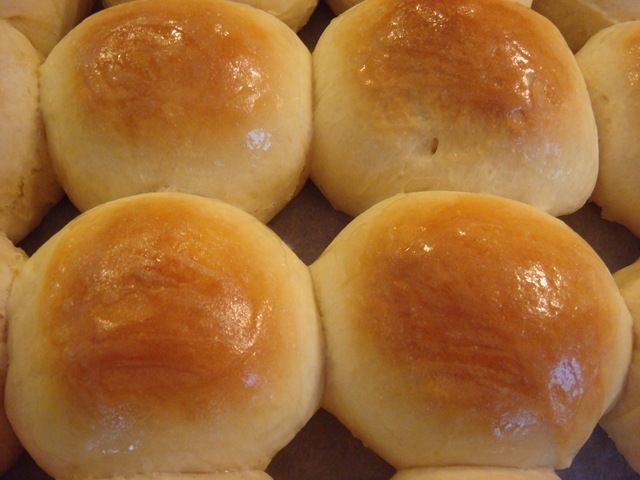 Bake rolls for 10-12 minutes, or until rolls just barely begin to brown, but are cooked in the center. Rolls should look slightly underdone (not completely brown). Remove from oven. Cool completely. Place in Ziploc freezer bags. Freeze. On serving day: Place frozen rolls on a baking sheet, bake for about 7-10 minutes, or until hot and golden brown. 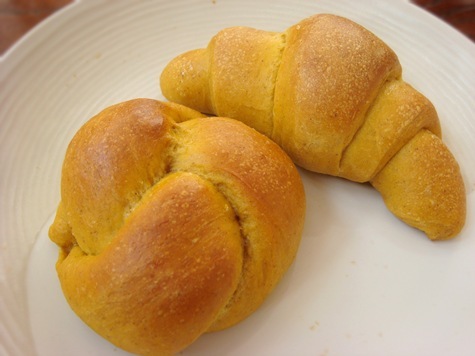 If rolls are thawed, bake for 5-6 minutes, or until browned. Brush tops with butter and serve immediately. Mix wet ingredients in a large mixing bowl. Add flour, gluten, sugar, spices, salt and yeast. Mix until thoroughly combined. 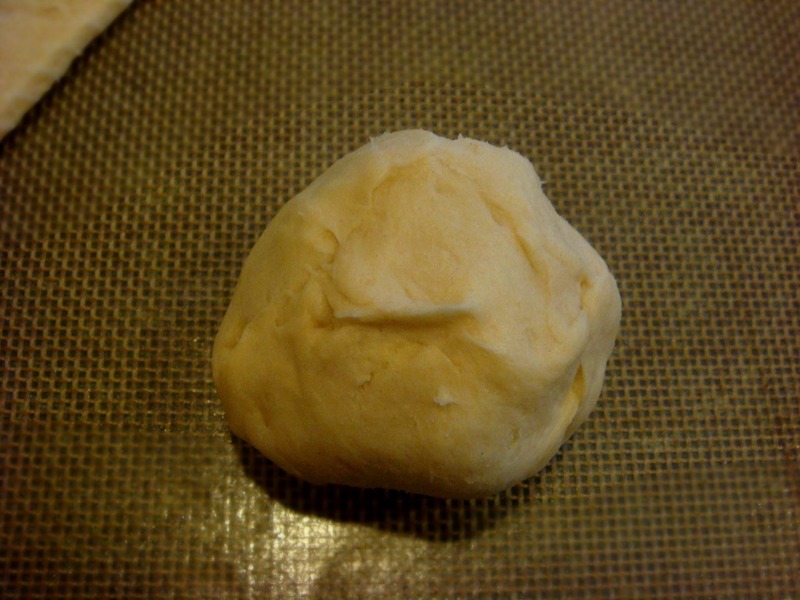 Add additional flour, if needed, a little at a time until dough just begins to form a ball. Knead for 5-6 minutes, or until dough pulls away from sides of the bowl and springs back slightly when touched. 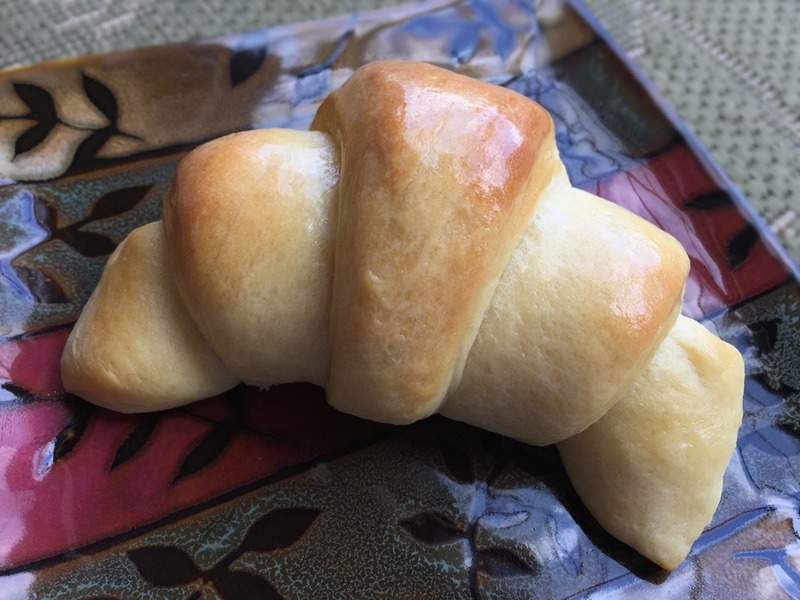 Shape into rolls (knots or crescents are what I usually make). Place on lightly greased baking sheets. Spray or brush with oil and cover with towel. Let rise for 30-60 minutes, or until doubled in size. Brush with egg white (room temp) mixed with 1 Tbs. water. Bake at 375°F for about 15 minutes. 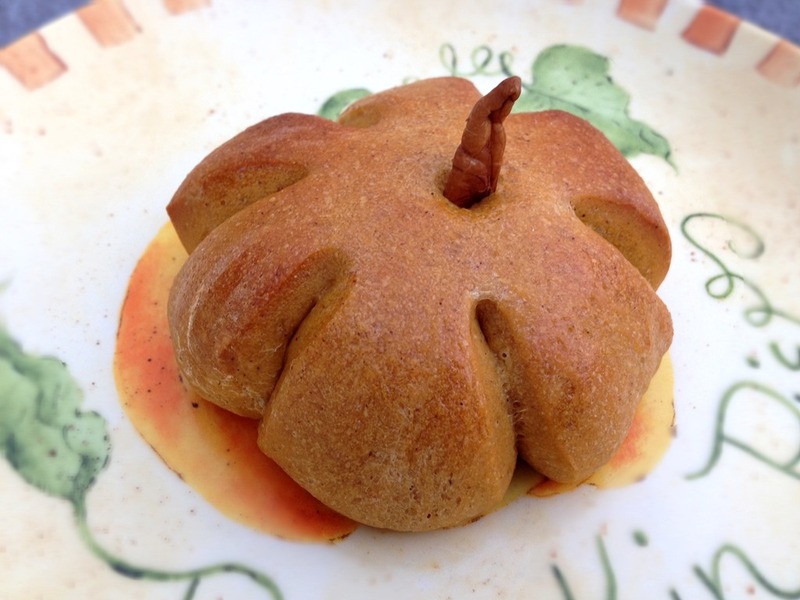 ***Pumpkin Pie Spice substitute: 1 tsp cinnamon, ¼ tsp nutmeg, and 1/8 tsp each allspice, ginger, and cloves. 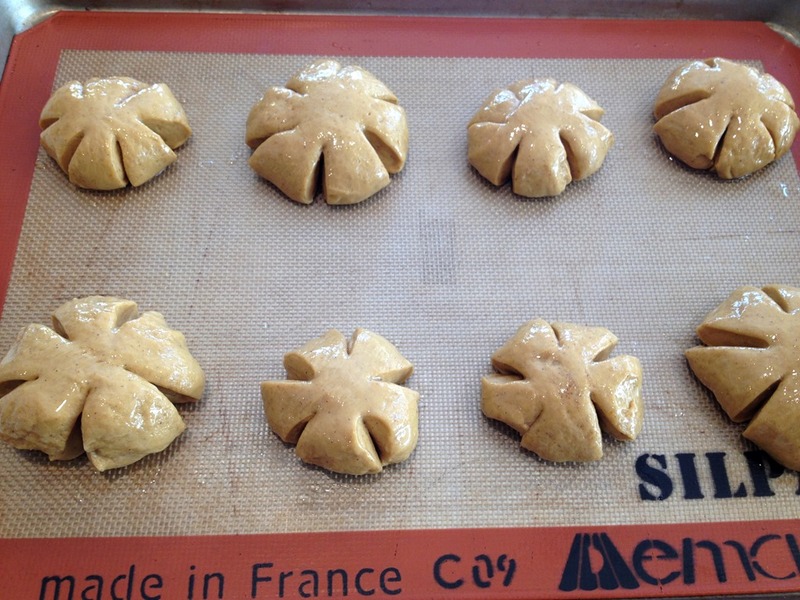 To make and freeze:Shape rolls and place on a large baking sheet lined with parchment paper or a silicon mat. Let rise as usual. 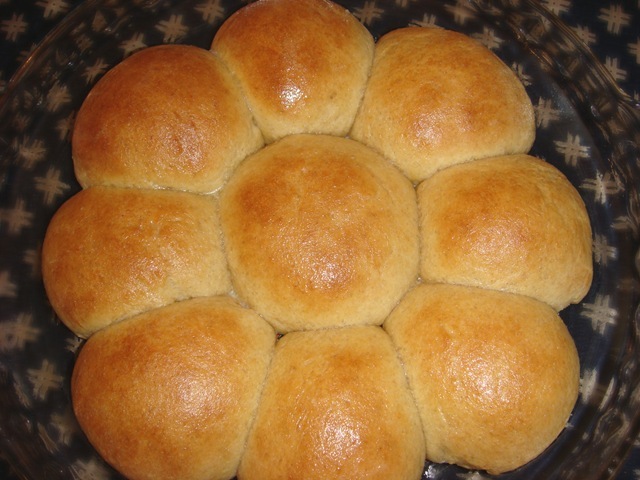 Bake rolls for 10-12 minutes, or until rolls just barely begin to brown, but are cooked in the center. Rolls should look slightly underdone (not completely brown). Remove from oven. Cool completely. Place in Ziploc freezer bags. Freeze. These white rolls are incredibly light and fluffy. Perfect for sopping up gravy, or spreading with cranberry sauce and filling with leftover turkey. The recipe is from one of my favorite food blogs: Our Best Bites. 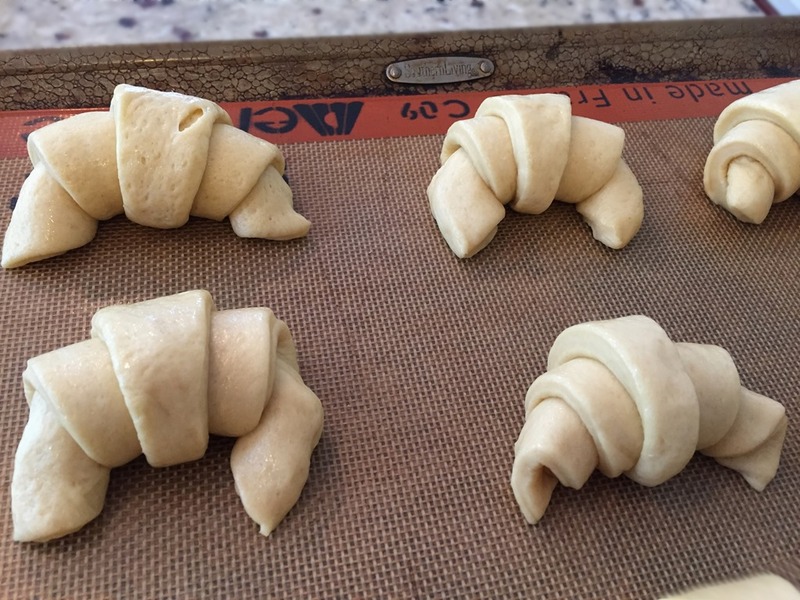 You could also shape them into crescents before baking. The whole wheat recipe is a simpler recipe than the white rolls, as it uses instant yeast (which only requires one rise) and there is no need to heat and then cool milk. But as they are made with 100% whole wheat, they are not as light and fluffy. I happen to prefer a hearty roll, but my kids prefer the white ones. 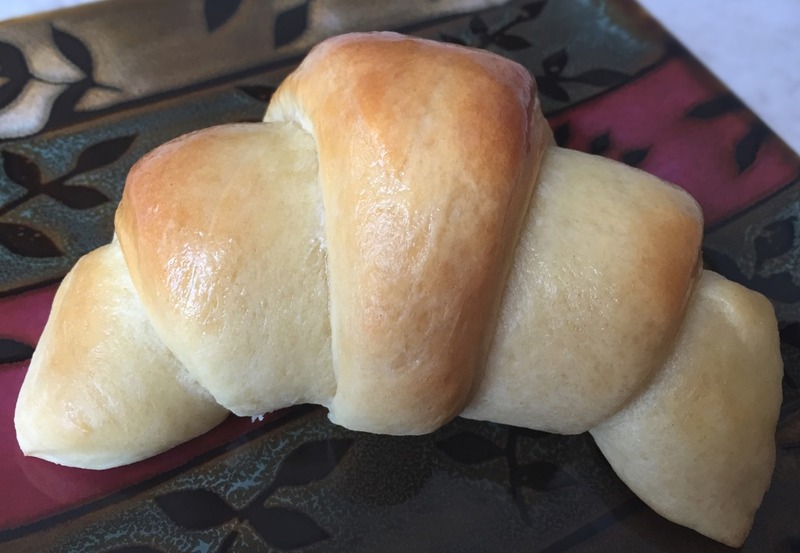 When making rolls for big gatherings I like to prepare and prebake them a few days ahead. 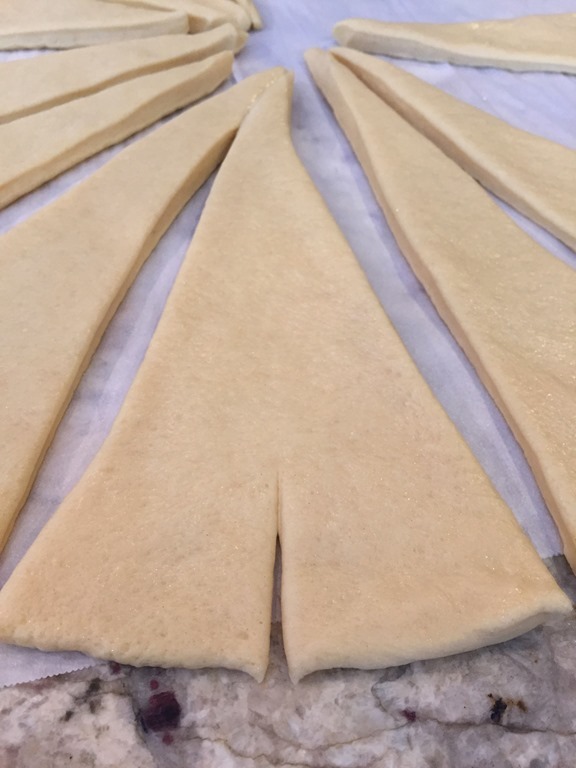 To make and freeze: Bake rolls on a large parchment paper lined baking sheet, leaving a little more space between rolls than if they were in a 9×13”pan. 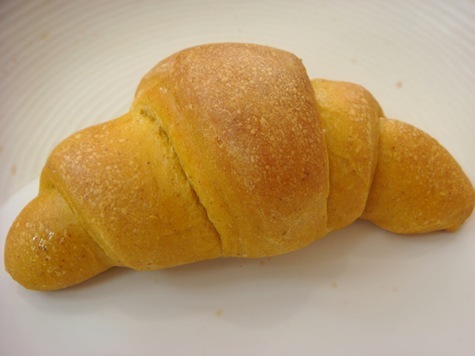 Bake for 10-12 minutes, or until rolls just barely begin to brown. Remove from oven. Cool. Place in Ziploc freezer bags. Freeze. Combine milk, 1/2 cup sugar, butter, and salt in a medium saucepan. Heat over medium heat until butter melts. Remove from heat. Allow to cool to lukewarm. Bake for 15-18 minutes or until golden-brown. When done, remove from oven. Rub a stick of cold butter over the tops of the rolls. In a large mixing bowl (preferable a stand mixer), add wet ingredients. Add 5 cups flour, gluten, powdered milk, salt and yeast. Mix until well combined. Knead in enough additional flour so that dough just begins to form a ball. Knead for 5-6 minutes. 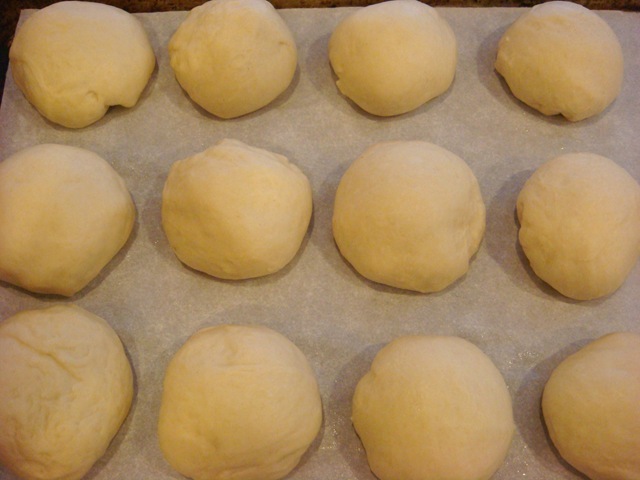 Let dough rest for 10 minutes before shaping rolls. Shape into balls (or other shape: knots are my favorite). Place in greased pans; brush with oil, cover and let rise until doubled in size. For a shiny roll: brush with slightly beaten egg just before baking (or brush with butter immediately after removing from oven). Bake at 375°F for 15-18 minutes, or until golden brown. ***Note: If using instant yeast, the dough only needs to rise once (after being shaped). If you are using regular yeast, allow dough to rise before shaping dough, then rise again in pans before baking. 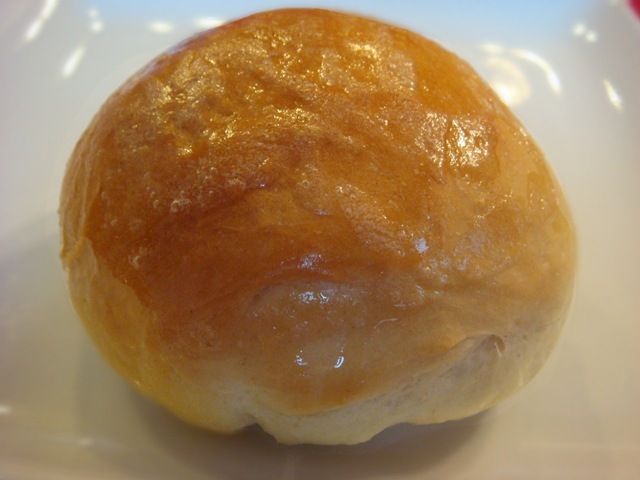 **To prebake for serving another day: Bake rolls on a large baking sheet lined with parchment paper, leaving a little more space between rolls than if they were in a 9×13”pan. Bake for 10-12 minutes, or until rolls just barely begin to brown. Remove from oven. Cool. Place in Ziploc freezer bags. Freeze.